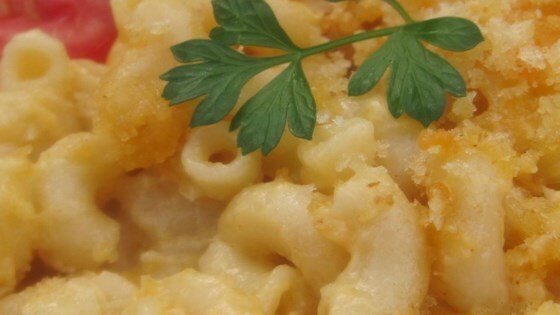 "Delicious macaroni casserole, topped with crispy and cheesy crust." Preheat an oven to 350 degrees F (175 degrees C). Grease a 9x13 inch glass baking dish. Fill a large pot with lightly salted water and bring to a rolling boil over high heat. Once the water is boiling, stir in the macaroni, and return to a boil. Cook the pasta uncovered, stirring occasionally, until the pasta has cooked through, but is still firm to the bite, about 8 minutes. Drain and mix with half of the butter. While the macaroni is boiling, melt the remaining butter in a saucepan over medium heat. Stir in the onions, and cook until the onions begin to soften, about 3 minutes. Stir in the flour, and cook 5 minutes longer. Add the milk and bring to a simmer, stirring frequently. Cook and stir until the milk has thickened, about 10 minutes. Once thick and smooth, stir in the salt, white pepper, Worcestershire sauce, hot pepper sauce, mustard, 2 cups of Cheddar cheese, and 1/4 cup of Parmesan cheese. Stir until the cheeses have melted, then stir in the macaroni until evenly coated. Scrape into the prepared baking dish, and smooth the top. Toss the remaining 1 cup Cheddar cheese and 1/4 cup Parmesan cheese with the dry bread crumbs in a mixing bowl. Sprinkle evenly over the top of the macaroni. Bake in the preheated oven until the macaroni is hot and the crust is golden brown, about 30 minutes. Loved it! Left out the breadcrumbs and put extra cheese inside. It was perfect! Thanks! this is the best mac and cheese i've ever had!